In Nov 2014, PNG (Papua New Guinea) became the latest entrants to ODIs as they played two official International matches against Hongkong – a grand entry, winning both of them. Hong Kong buckled under pressure as Papua New Guinea successfully chased down 261 to win the second ODI cricket match in Townsville, Australia. Earlier Papua New Guinea, beat Hong Kong by three wickets in their first ever ODI. The frequent traveller may not be perturbed and many not listen – airhostess would stand and start miming to the announcement – ‘please listen to the safety instructions’ – in case of air pressure, oxygen masks would descend. Life jacket is placed below - “in the event of an emergency, inflate your lifejacket’ – and would reel further to say that in the unlikely event of a landing in water (sea !) .. .. .. do you feel scary or ever thought of whether it is useful safety instruction, whether one could remember them on emergency and whether plane could actually land on sea ? ~ next time you hear this, you may feel different ! – if not with fear !! Air Niugini Limited is the national airline of Papua New Guinea, based in Port Moresby . It operates a domestic network from Port Moresby and Lae, as well as international services in Asia, Oceania, and Australia. Micronesia is a subregion of Oceania, composed of thousands of smaller islands in the western Pacific Ocean. It has a shared cultural history with two other island regions, Polynesia to the east and Melanesia to the south. Micronesia is divided politically among several sovereign countries. The Micronesia region encompasses five sovereign, independent nations—the Federated States of Micronesia, Palau, Kiribati, Marshall Islands, and Nauru—as well as three U.S. territories in the northern part: Northern Mariana Islands, Guam, and Wake Island. You are reading about all these as one ‘Air Niugini plane’ overshot runway in Micronesia and sank in sea lagoon. 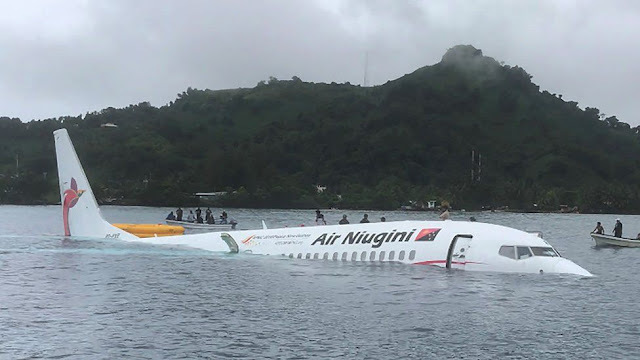 Reports state that a Papua New Guinean plane has sunk in a lagoon after overshooting the runway in the Federated States of Micronesia. 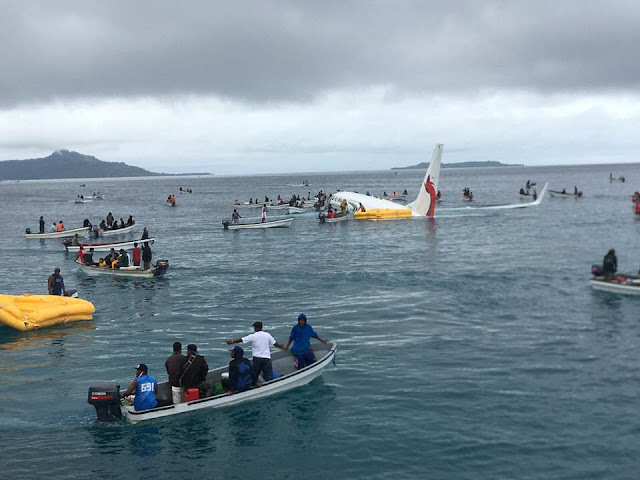 However, all passengers were reportedly rescued safely from Air Niugini’s partially submerged Boeing 737-800. Flight 73 flies between Pohnpei in the Federated States of Micronesia and Port Moresby, stopping in Chuuk State. One witness said the plane was coming in to land. Videos posted to social media show dozens of people in boats around the wreckage. Local media said the 36 passengers and 11 crew members were safe. The Air Niugini plane which landed in the ocean is stated to be Flight PX073 which is scheduled to fly Pohnpei - Chuuk - Port Moresby. Photos show small boats effecting rescue. 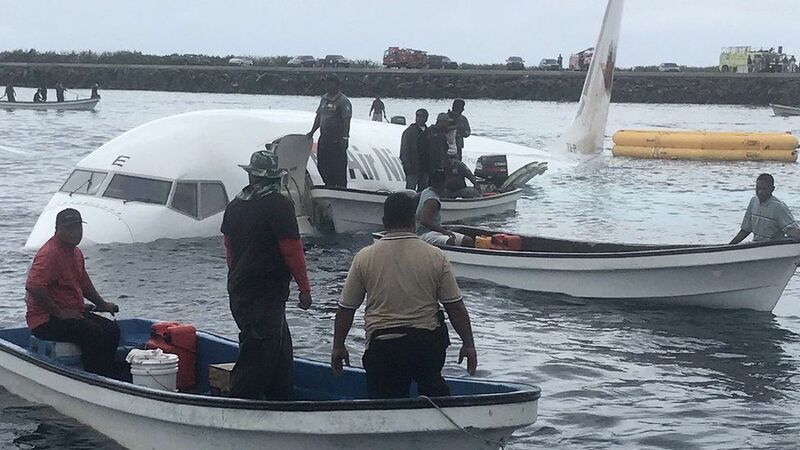 An eyewitness is stated as saying that he heard and saw the plane coming down and thought it to be normal landing but realized that the plane had overshot, went to sea and started sinking. BBC adds that the plane crashed and in around five minutes the rescuers were there, they were ordinary people, because there are plenty of boats around the shore. The officials were about 10 minutes. Another employee said the runway was known to be very short. The good news is there was no human casualties – all 36 passengers and 11 crew were rescued from the plane before it sunk in the lagoon. They were taken to hospital, where eight remained, four in a serious condition with bone fractures and other injuries, according to a hospital spokesman. Next time on board a plane, listen to the safety instructions more carefully ! Clarion call ~ vultures in line of extinction !! Kathmandu does well ~ to pay bonus !! liquefaction that can sink a Ship !! Alastair Cook is playing his last Test innings ! !